Say goodbye to long lines and ugly paper tags. Nowadays if you're flying with carry-on luggage, you can easily skip the check-in lines by doing it all online ahead of time. Sadly, it requires a few more steps if you have to check your luggage -- you still need to go print out your tag at the airport, tie it onto your suitcase and then drop it off at the counter. The folks over at Rimowa and Lufthansa are hoping to simplify that process, because for Germans, every second counts. 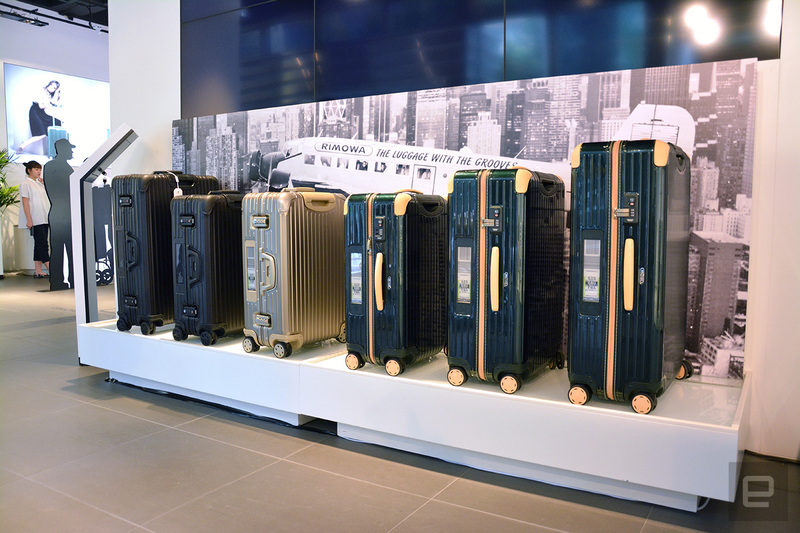 In Hong Kong, we checked out these fancy suitcases that are updated with an embedded E Ink display -- a HK$500/€60 premium across the existing range, except for the untouchable Classic Flight series -- and hear about where Rimowa's at with this feature's rollout. Rimowa's electronic tag is essentially an E Ink display with the same width as a standard paper luggage tag (it already has the green stripe required for all flights departing from European airports), and it uses Bluetooth radio to grab data from either Rimowa's dedicated app or supported airline apps -- right now these are only available on iOS. The Rimowa app is for initiation as well as switching the tag to contact information mode -- so that the E Ink display can still be of good use if your airline or airport don't support electronic tags. As for the airline app, simply use its luggage check-in tool to sync the electronic tag, then just drop the suitcase off at a dedicated airport counter (pending ID verification, of course). Bluetooth pairing can only be enabled with a button inside the suitcase (30 seconds per session), so you'll obviously have to set a passcode on the locks just to be safe. The electronic tag module is powered by two AAA batteries which can refresh the display up to about 800 times per charge. And due to the nature of E Ink, the image is retained even if the module runs out of battery. The E Ink display is shielded by a piece of "highly robust" Gorilla Glass, which begs the question: What if it takes a hit? We all know that Gorilla Glass isn't shatterproof. Rimowa's response was that according to their TÜV Rheinland lab test results, the chances of the screen getting damaged is actually lower than that of a suitcase losing an ordinary paper tag. We find that hard to believe, but we'll just have to take the company's word for it. 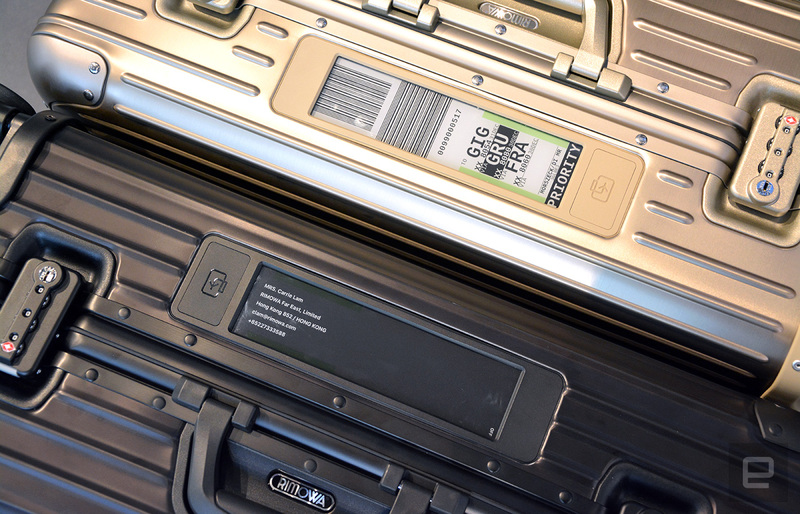 Additionally, just like the suitcases themselves, the E Ink display is also covered by Rimowa's five-year warranty. It's obviously still early days for this tech, because so far, Lufthansa is the only airline that's been supporting this service since March, and this is only available at three airports in Germany -- Frankfurt, Munich and Hamburg -- where Lufthansa has self-service baggage kiosks. That said, United Airlines is already testing this, and several other airlines are in discussion with Rimowa (you may recall that British Airways was also interested in a similar technology three years ago), so there's a good chance that we'll be hearing more announcements later this year.